Today I thought I would talk about what just might be one of my favorite products EVER – Rory’s Story Cubes. I first discovered this game when I was researching an article on fun learning games for elementary school-aged children. Now, even though I’m not in elementary school and my girls aren’t yet old enough to be in elementary school, I immediately saw the creative possibilities this little game could have for adult writers who find themselves blocked. And I immediately fell in love with it! As soon as I had the opportunity, I took my little set of Rory’s Story Cubes to my local writer’s group meeting one Saturday evening, and the group went wild for it! I mean, they really loved it! In just fifteen minutes, we were able to come up with some wildly creative stories using these little dice. As the instructions on the box state, there are actually three ways to play, but I usually only use it one way. You just roll all nine cubes and try to connect the images on the face up into one cohesive story. And now come up with a story connecting all the images pictured. I’ll do one for you as an example. My mail came early that Saturday morning, and I eagerly opened the envelope with the return address I knew so well. It was an invitation from my eccentric aunt to visit her cozy beach bungalow in the Florida Keys. I hurried over to my desk calendar and checked my appointments and obligations. The next few weeks were pretty wide open, so I called my travel agent to make the necessary flight arrangements. “When would you like to fly out?” she asked me. I spent the rest of the day making arrangements for my departure. I had to pack. Then I needed to find someone to take care of my pet cat while I was gone. Then there was the little matter of calling my boss and letting him know that I wouldn’t be coming into the office for the next week. I didn’t think he’d mind too much because this was a slow season, and I was right. He just told me to have a safe trip, and he told me that he’d see me the next Monday. I hummed merrily the rest of the day, anticipating a relaxing, restful vacation. I didn’t, of course, have any idea what was in store for me that evening. I got to the airport without incident, although I did notice the increasingly dark cloud cover moving in over the city. It seemed to be going south…headed in the exact direction my plane would be going. I frowned. It didn’t look good at all. Still, the flight crew apparently didn’t think it was going to be a problem, and we boarded the plane and took off right on time…unusual for almost any flight. I think the fact that this was the last flight of the day had something to do with the prompt departure. Within minutes after we were in the air, though, the little plane the twenty-five other passengers and I have been crammed onto was tossing and turning in the turbulent storm. Lightning flashed around us, and I heard a crackling sound as one of the engines caught fire as a bolt hit its main target – our airplane! Although every single passenger on the plane (including me) was panicking in an instant, the flight crew remained calm. The head flight attendant picked up the handset for the plane’s intercom system and spoke quickly, but serenely. “Please don’t panic. There is a parachute located under every seat on this plane. Please remove it from its locked position and strap it on your back.” She then took her own parachute and proceeded to show us how to strap it on. Parachute? I thought, as I fought to regain control of my overanxious brain. That could only mean one thing – the plane was going down, and we needed to make a hasty exit. I looked out of the nearest window from my aisle seat and saw only sky and water. Why are we over water? We shouldn’t be at the ocean yet! My face registered my doubt, but no one was paying much attention to my facial expressions. They were all too concerned with saving their own skins. The patient flight attendants did their best to herd us all to the front of the plane in an orderly fashion. One by one, the frantic passengers jumped out of the plane. Some, understandably, were more hesitant than others, but no one was left behind. We all jumped. 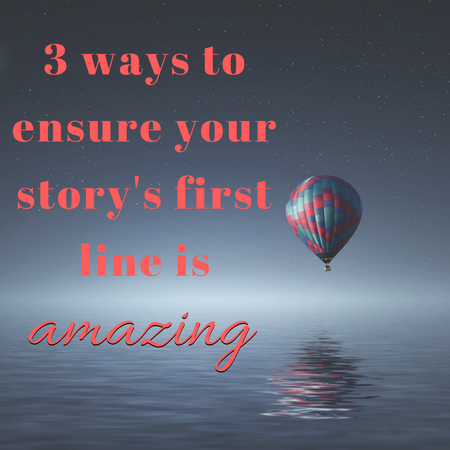 The thoughts of crashing to the ground in a speeding airplane or burning up in a massive engine fire spurred us all into action. At least, with the parachutes, there was some chance of a safe landing. Drifting down to the ground with my parachute was a much more calming sensation than I’d previously thought it would be. My fellow passengers drifted down with me in various stages of progress – some below, some above, some beside me. But we all (seemingly) landed safely on a sandy beach somewhere in Florida. My landing was not a graceful one, and as I stood to my feet I noticed how beautiful the moonlight looked against the calm ocean. The storm had passed, and I was safe. Several feet off in the distance, I noticed a steady dark line moving off into the water. Some of the other passengers and I were drawn to this line by a force that we couldn’t identify and couldn’t define. When we neared the dark line, we saw that it was made up of little baby turtles…new hatchlings making their way toward the sea and the welcoming moonlight. I smiled at the promise of new life and turned and walked away from the ocean in the direction of some distant city lights. And that, my friends, is an example of how you can use Rory’s Story Cubes to quickly and easily get you back to writing again. That little story took me all of 45 minutes to write. 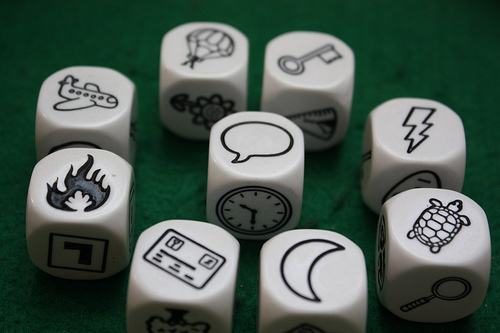 Have you used Rory’s Story Cubes before? Are you interested? Share your thoughts in the comments!